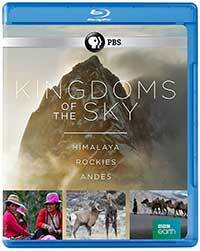 PBS gives viewers another nature documentary thanks to BBC Earth with Kingdoms of the Sky and it is a stunner. The three episodes—Himalaya, Rockies, and Andes–give us rare views of life literally on top of the world. Director Alex Lanchester takes us gradually up the sides of the mountains that form this vast Asian range of the highest peaks in the world. Along the way, we meet the wide variety of fauna including monkeys, bats, camels, marmots, yaks, and spiders that are specially adapted to the different climates and altitudes that create just about every ecosystem found on our planet. We also meet the indigenous peoples that have been able make lives for themselves in the “sky.” The vast and harsh Tibetan Plateau is bordered by Mount Everest where an annual marathon starts at the base camp with an altitude of 17,000 feet that tests both the bodies and spirits of its competitors. Finally, there are those who risk their lives trying to scale the highest peak in the world. The scene shifts to the largest mountain range in North America, the Rockies. Described by producer/director Steve Greenwood as “the last great sanctuary of the iconic animals of America,” this chapter begins with Bighorn sheep preparing for their annual two-day mating season as winter is about to start. Next is the dance of the Northern Lights as this harsh season challenges the lives of its hardy animal species like the wolverine and its natural enemy, the wolf. A rugged female mountaineer takes on one of the highest peaks and survives its challenges. Spring is the season of numerous waterfalls as the ice and snow melt while prey and predators abound. Summer features humming-bird breeding and human parasailing and concludes with the Indian Relay, the oldest sport in the Rockies. 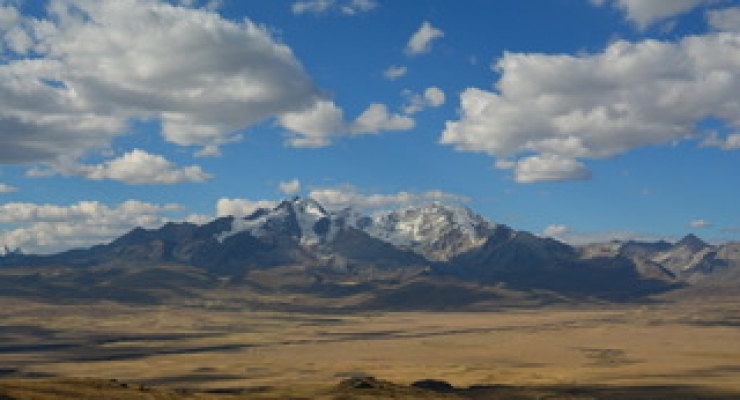 The longest mountain range in the world, the Andes transverse nearly the entire length of the South American continent. Director Matthew Wright starts in an Ecuadorian cloud forest that receives enough rainfall to support its highly varied species of plants and animals. The scene shifts dramatically to Cape Horn with its constantly changing weather patterns, and back to the north, we visit the great Bolivian salt flats, Salar de Uyuni. Macchu Picchu, the most famous ruins in South America, precedes views of roads winding through the central Andes that provide serious challenges to those bold enough to navigate them. The youngest of the world’s great mountain ranges, the Andes also contains the most active volcanoes on Earth, as its tectonic plates are continually shifting. Near the conclusion, a pair of brave climbers scale a nearly vertical 17,000-foot peak in a mere ten hours and stand above the clouds in exultation. As we have come to expect from BBC Earth, the cinematography in Kingdoms of the Sky is absolutely the greatest show on Earth. Detailed close-ups of the animals and stunning panoramas of the massive mountains are awe-inspiring and soul-stirring. There is a vibrancy to the colors of nature that no artifice could duplicate. The soundtrack for Kingdoms of the Sky is a very clear and atmospheric DTS-HD MA 2.0 and the original scores from each episode convey the power and majesty of some of the highest spots on our planet. For those unfamiliar with this variety of views from the world’s heights, this three-part series will be a real eye-opener. The wealth of scenery in the different ecosystems harboring a wide range of animal species are fascinating and receive brilliant cinematography and direction. PBS and BBC Earth have done it again! Highly recommended. A brilliant collaboration between PBS and BBC Earth that yields astonishing footage of the three greatest mountain ranges on the planet and the incredible adaptations that plants and animals make simply to survive some challenging ecosystems.